A macaw is any parrot (family Psittacidae) belonging to one of six genera: Ara, Anodorhynchus, Cyanopsitta, Primolius, Orthopsittaca, and Diopsittaca. They are native to Mexico, the Caribbean, and Central and tropical South America and are known as araras in Portuguese and guacamayos in Spanish. Macaws are known for their often colorful plumage. Human beings can experience great joy from the sight of a hyacinth macaw in a tree, or by observing the impressive flight of colorful blue-and-yellow macaws overhead, their wings slowly beating as their long trailing tails glisten in the sunlight. However, human beings also have the responsibility to love and care for creation. Instead, many macaws are now endangered, not only because of loss of habitat, but because of direct and illegal exploitation, such as plundering nests and taking young birds for the pet trade. Parrots or psittacines is an order (Psittaciformes) of birds that includes over 350 known species. They are usually grouped into two families: the Cacatuidae (cockatoo) and the Psittacidae (true parrots). Macaws are members of the true parrots. Like other parrots, macaws have a generally erect stance and a characteristic curved beak shape with the upper mandible having slight mobility in the joint with the skull. Parrots also are zygodactyl, having four toes on each foot, with two toes at the front of each foot and two at the back. Macaws have very long tails, large and strong beaks, and usually brilliant plumage. In terms of length and wingspan, the macaws include the largest birds in the parrot family, although the flightless Kakapo is heavier (Marshall 2006). The largest macaw is the hyacinth macaw (Anodorhynchus hyacinthinus), which reaches 100 centimeters (almost 40 inches) in head and body length and 1.4 to 1.7 kilograms (3 to 3.7 pounds) in weight; the smallest is the red-shouldered macaw, which reaches 30 centimeters (11.8 inches) in length and 129 to 169 grams (4.5 to 5.9 ounces) in weight (San Diego Zoo 2007). The hyacinth macaw's wingspan is more than four feet (San Diego Zoo 2007). Macaws eat a variety of fruits, nuts, seeds, flowers, and even insects and snails. Their powerful beaks allow some species to crush very hard nuts, such as the Brazil nuts. Some macaws are known to eat clay as an antidote to the toxic chemicals in the seeds or fruits they eat. Scientists have found out that the chemicals in clay mix with the poison allowing it to pass through the bird's digestive system unharmed. Macaws are monogamous and usually pairs bond until one of them dies. After the eggs are laid, the mother incubates until the chicks hatch while the father brings food. Macaws have a life span of about 50 years, but there are longer lived macaws (Marshall 2006, San Diego Zoo 2007). Many species of macaw are associated with forest, especially rainforest, although others prefer woodland or savanna-like habitats (Marshall 2006). The Pantanal of Brazil, Bolivia, and Paraguay, known as the world's largest wetland, is home to the blue and yellow macaw (Ara ararauna), green winged macaw (Ara chloroptera), red-shouldered macaw (ara nobilis), and remains one of the best environments to see the endangered hyacinthin macaw (Anodorhynchus hyacinthinus) (Swarts 2000). Various reports put the scarlet macaw (Ara macao), just outside the Pantanal boundaries, in the state of Mato Grosso, Brazil (Swarts 2000). The following list of macaw species includes some currently known to be extinct in the wild, (Spix's macaw), extinct overall (Cuban red macaw, Saint Croix macaw), and believed to be extinct (glaucous macaw). Previously, the members of the genus Primolius were placed in Propyrrhura, but the former is correct as per International Commission on Zoological Nomenclature (ICZN) rules. The majority of macaws are now endangered in the wild. Five species are already known to be extinct, Spix's macaw is now considered to be extinct in the wild, and the glaucous macaw is also probably extinct, with only two reliable records of sightings in the twentieth century (Marshall 2006). The greatest problems threatening the macaw population are the rapid rate of deforestation and the illegal trapping of birds for the bird trade. The Spix's macaw (Cyanopsitta spixii), the only member of the parrot genus Cyanopsitta, probably went extinct in the wild around 2000, when the last known wild bird died; however, there is a captive population of some 68 individuals (BirdLife 2006). 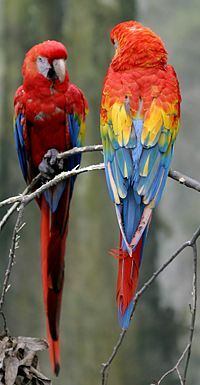 The Cuban red macaw, Ara tricolor, is an extinct species that formerly occurred on Cuba and the Isla de la Juventud, and was common in the early 19th century. However, loss of habitat due to widespread deforestation, as well as hunting and plundering of nests for young birds for pets let to its extinction before the 20th century. The problem with illegal trafficking in macaws is clear when it is realized that a single hyacinthin macaw can fetch US$6,500 to US$12,000 in the United States (Swarts 2000). 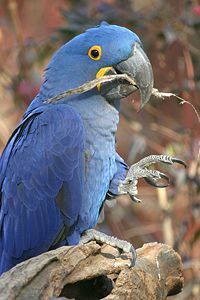 In February of 1999, authorities interdicted an effort to smuggle 24 hyacinthin macaw eggs from Sao Paulo, Brazil to Pennsylvania, with the value of the eggs estimated at US$10,000 each (Swarts 2000). Parrots in general make popular pets. However, macaws, with their powerful jaws and large amount of intelligence can be difficult pets. They gnaw and chew on various objects and require constant intellectual stimulation to satisfy their innate curiosity. Used to bonding for life with a mate, in captivity unmated macaws will bond primarily with one person–their keeper. Pet macaws thrive on frequent interaction, and a lack of this can lead to their mental and physical suffering. Captive pet macaws sometimes display difficult behavior, the most common being biting, screaming, and feather-plucking. Feather-plucking does not normally occur in the wild, strongly suggesting that it is the result of a neurosis related to life in captivity. Most pet macaws had ancestors living in the wild just two or three generations ago, and are not truly domesticated by any reasonable definition (this is unlike, for example, dogs; some estimates put the domestication of dogs as far back as 40,000 years ago). All species of macaws have very powerful, large beaks. Just as they a capable of cracking nuts with those jaws, they can harm fingers and even knuckles of children and adults. They can also be very loud. International trade in macaws is illegal under the CITES agreement. Only captive born birds may be sold as pets. A common trend in recent years is hybridizing macaws for the pet trade. Hybrids are typical macaws, with the only difference from true species being their genetics and their colors. For example, a hybrid may be made between Ara ararauna and Ara chloroptera, or between Ara ararauna and Ara macao. As a number of species of macaws are endangered, it would be beneficial to maintain pure breeding stock of captive macaws to ensure species preservation. Hybridizing dilutes the available gene pool and could hasten species extinction. As with many species of parrots, macaws can imitate human speech or other sounds, using the expelling of air across the mouth of a bifurcated trachea (rather than vocal cords, which are not present in parrots). 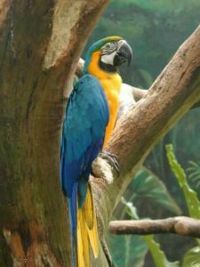 The results of an almost two decades long study by Michael Dalton (2007, 2009) on a blue-and-gold macaw (Ara ararauna) named Arielle suggests a high learning ability. By recording Arielle's volunteered speech and then analyzing what she said—a research methodology termed "passive speech research," because there is not direct participation by the researcher to influence what the animal says—Dalton recorded that this bird possesses a range of verbal capabilities, including the ability to use words in the correct context and communicate with creative expressions. Some of the reported linguistic abilities reported by Dalton include Arielle's capacity (1) to learn cognitive speech lacking a specific model; (2) to transfer meaning for words to new situations; (3) to use synonyms without specific training; (4) to learn to substitute pronouns appropriately; (5) to pose and answer a question; (6) to attribute characteristics to others; and (7) to improvise related sequences of statements about a single topic. Overall, Dalton (2009) has reported this bird has spoken more than 6000 variations of expressions, including sentences with as many as 15 syllables and sequences of two to four topical sentences. BirdLife. 2006. >Spix's Macaw: BirdLife Species Factsheet. BirdLife. Retrieved April 15, 2007. Marshall, R. 2006. Macaws. AvianWeb. Retrieved April 15, 2007. San Deigo Zoo. 2007. Birds: Macaw. San Diego Zoo's Animal Bytes. Retrieved April 15, 2007. All links retrieved August 6, 20184. This page was last modified on 6 August 2018, at 16:20.